Krennic is on the verge of greatness, he is this close! Unappreciated genius and cunning tactician - In Star Wars: Legion Krennic is the fourth Imperial commander and first commander not from the original trilogy and he brings a whole new set of tricks to the way the Empire plays. Krennic is a commander who excels in disrupting his opponents plans and supporting his troops. He does this through his command cards and the Compel keyword. Krennic is aggressive and adaptable on the field and can be played in different ways according to your needs. At first glance Krennic might seem like a variation of Veers, trading Veers’ vehicle synergy for troop synergy, which isn’t entirely wrong - but there is a lot more to Krennic. Krennic by nature is a support commander and therefor his damage output is not a primary concern, although it is not bad by any means. Similarly his durability is not his main focus and he is happy to supplement it by not being in line of sight or further back from the enemy. So now that we are sure we aren’t taking Krennic for his damage output or tankiness we should cover what we are taking him for… his control and his tricks… and that cape! Krennic comes with quite a few synergy buffs in the form of keywords. Some of these keywords aren’t new like Entourage which allows Krennic’s Deathtroopers an extra bit of activation control, but Cunning and Compel are both new and quite interesting. Cunning allows Krennic to automatically win ties on command cards if the card he played has his face on it. This means that when making critical plays you can guarantee you win the initiative instead of rolling off for it and potentially letting greatness slip away. And as powerful as Cunning is, Compel is even more powerful. Compel allows Krennic to force his suppressed- but-not-panicked units to always have two actions - if a unit is suppressed but not panicked they can take another suppression to gain a move action at the start of their turn. The keys to remember here are that they have to be suppressed so they can never get a third action from Compel as they will have to lose their first action due to being suppressed. The second point is that the move action has to be the first thing they do, so you have to plan around it - you can’t take an initial action and then get the Compel move. The biggest reason to take Krennic though are his command cards which we will cover below. Voracious Ambition: initiative 1, Krennic only; This command card has no inherent effect - It gives Krennic an order token and then you get to pull 3 order tokens to keep in secret, essentially letting you have 3 extra order tokens out in your opponent doesn’t know about. If you combine this with his Entourage’d Deathtroopers this gives you 5 units you have control over - what it really does though is give you quite a bit of activation control and a command card that beats every other command card except Sorry About the Mess. The lack of an inherent effect is mildly disappointing when compared to other cards, but the speed and control this card gives you is easy to underestimate and this card is actually quite powerful once you understand what it is really giving you. In other terms, think about it as a Sorry About the Mess that doesn’t give you free tokens, but instead you get to pick which unit in your army goes before everything else. Deploy the Garrison: initiative 2, 2 Trooper units; This card allows you to pick 2 units with face up order tokens and issue them a standby token before the activations start. It is important to note that it’s only 2 trooper units so you can’t abuse this card with HQ uplink spam. This card can be incredibly powerful when planned for in the previous turn, especially on a unit like Deathtroopers who get a free aim and have Precise 2, combined with Overwatch and you are getting to double attack with them with aim tokens for a devastating response. The key to this card is knowing when to time it and how to set it up. One notable trick with this is that when paired with Vader, Krennic can issue the order to Vader, activate vader first to force push an enemy unit within range 1 which would trigger the standby on Vader who could then take a move and attack with relentless and then finish the rest of his turn with two moves. Essentially giving Vader a second slightly worse Implacable. It is very important to get the timing right with standby tricks as a unit loses its standby token if it moves, attacks, or gets a panic token. Annihilation Looms: initiative 3, Krennic and 2 Trooper units; Yet another incredibly powerful command card for Krennic. This card gives every single trooper unit on the table a suppression token and then a second suppression if it is turn 5 or 6. This is incredibly powerful when playing for scenario, it allows Krennic in the early game to suppress all of the enemies troops taking away one of their actions and allowing you to get the advantage on scenario… while at first glance it seems like it might hit you just as hard, in reality with Compel your troops will still get the move forward to get into position, they will also have 2 suppression now meaning that at the beginning of next turn they will have one left improving their light cover to heavy if they can gain it. Although this card has an extra benefit for playing it late in the game, it is almost always more impactful to play it early in the game for the scenario and attrition lead it gives you that you can leverage throughout the rest of the game. Krennic can take two Command upgrades and one Gear upgrade. As far as the gear slot goes Krennic is best taking something to help bolster his support role, either by keeping him in the fight longer or closer. Stimms is the obvious and more common upgrade on Krennic keeping him alive longer, but Environmental Gear is also a solid choice allowing Krennic to stay farther back and then move unhindered into a Key Position to support his troops or claim an objective at a pivotal moment. Krennic also has two command upgrade slots to fill. Esteemed Leader should almost always be one of them to help keep Krennic stay alive when he is caught out in the open. For the second slot you have several strong options- Improvised Orders plays to Krennic’s strengths of diverse troop types, especially if you are mixing in Scouts, Deathtroopers, and Corps units. Strict Orders is also a strong choice for Krennic who is going to want to run his troopers hotter on suppression than other commanders, Strict Order can help alleviate that by allowing you to remove suppression from key pieces when needed. Commanding Presence isn’t a bad choice either though when playing your Scouts and Deathtroopers farther out from the body of your army. Any choice here is not wrong, so pick something that fits your needs and playstyle. Krennic can be played in much the same way as Veers. Both are mid-field support commanders who rely on enhancing the units they are with to carry them to victory. The key difference is that Krennic supports troops while Veers mainly supports vehicles. Most scenario games will see Krennic playing Annihilation Looms turn 1 or 2. The reason for this is that it gives you the most significant boost in board control and scenario presence. Even though it grants you a bigger effect in later rounds, playing it early will gain you the most actual benefit and have the most detrimental effect on your opponent. The main idea is that you will give everything on the board 1 suppression which will take away an action from 67% of the opponents corps units. This may not seem like a huge advantage, but it will force your opponent to only get single moves with their corps units meaning they likely won’t be in an optimal position and still trying to unpack their corps units on turn 2. Krennic’s forces on the other hand will still get double actions because of Compel, meaning they will already be in position and half a turn ahead of the opponents troops. Later in the game, especially turns 3 and 4, this card is less effective because troops are already in position and so losing an action often isn’t as devastating - it generally is the difference of an aim or dodge which while nice isn’t as crucial as the turn 1 unpacking. This card is also powerful round 5 or 6 if you have killed their commander and are able to start panicking units away from the objective, but this generally is less reliable than the advantage you can leverage from playing this card early. Deploy the Garrison is generally a turn 3 or 4 card and will see the biggest benefit on a special forces unit with Overwatch, especially Scouts, IRG, and Deathtroopers. This card is fairly straightforward in its use, but you absolutely have to plan ahead the turn before to set it up. Ideally you will have the standby units behind cover near an objective so the opponent has to come to you or have some way to force the standby to trigger favorably such as Force Push. Ambition is also fairly straight forward in its use, essentially just being a super fast card that can guarantee you go first allowing you to set up a last / first with a particular unit or to get a key unit before it has a chance to react or get a key unit of yours to safety before the opponent can get you first. Play it similarly to how you would play Sorry About the Mess. Once Krennic’s command cards are spent, he is best used for holding a mid-field objective, issuing a free order to a Deathtrooper through Entourage, and using Compel to keep your troops moving and fully activating. His gun can do a moderate amount of damage if he gets an opportunity to use it, but because of his lackluster defenses he should rarely go in search of combat, instead waiting for it to come to him. 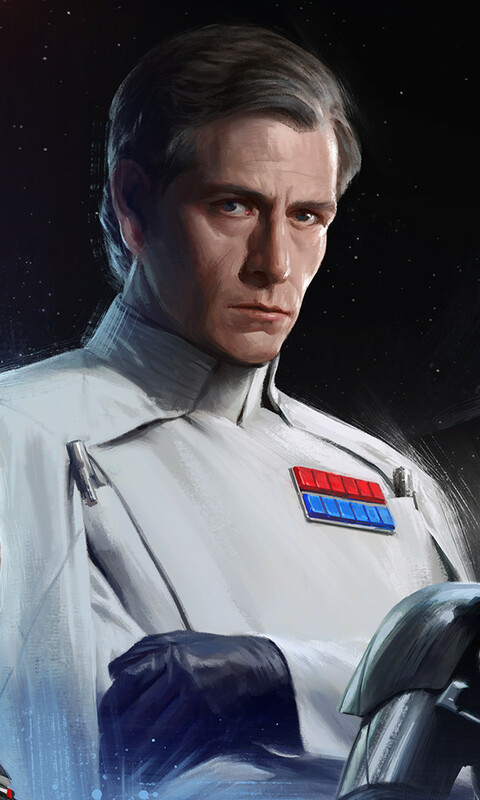 Krennic’s forces will tend to be very troop heavy, and focused mainly on specialized units. Deathtroopers are an obvious choice to take with him, and although you can take up to four units with him, it’s often best limit yourself to two. Snowtroopers are also a common and strong choice with Krennic due to his Compel ability. Snowtroopers are often prime targets to be suppressed and they lose almost all of their effectiveness if they can't double move, Compel is a cheap reliable way to keep multiple units moving even when being suppressed. The scariest part of Krennic is his command cards, the model itself is not much of a threat. This means that when playing against Krennic you must always anticipate his next command card and prepare for it in the preceding round. A lot of this will be done in deployment, expect that most of your courage 1 units will lose an action in the first round or two and deploy accordingly so that they can still contribute to the action as quickly as possible - often this means deploying as close to the objective as possible even if that means forgoing cover. It also means being aware of units that are set up to receive standby tokens in the following round and having a plan to deal with them. Often this can be a getting a unit into range to split fire and remove the tokens, but it can also mean having a plan to avoid the area or make those units act first or move to waste their tokens. Krennic has fairly low defensive stats, if you get a chance to take him out of the game before he gets through his command cards you should take it, but you shouldn’t seek it out as often you will have more pressing units to deal with such as his deathtroopers or snowtroopers that he will bring… making Krennic himself rather low on the priority list.